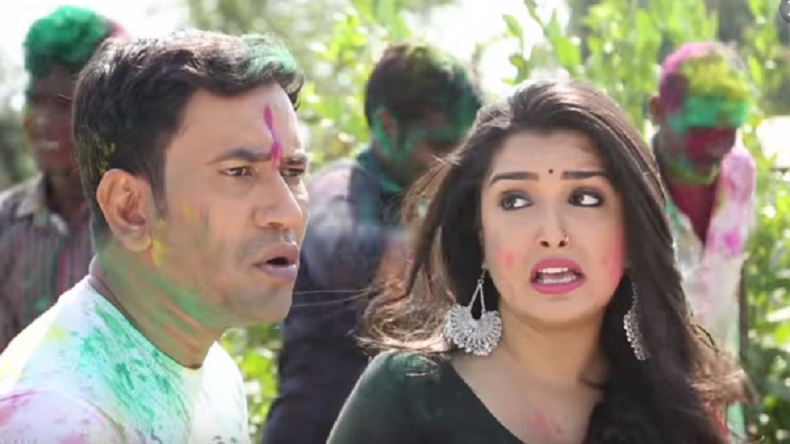 Bhojpuri Holi Songs 2019, Latest Bhojpuri Holi Geet 2019: We get you all the superhit Bhojpuri Holi songs of 2019 featuring Khesari Lal Yadav, Pawan Singh, Nisha Dubey, Dinesh Lal Yadav aka Nirahua, and Amrapali Dubey which will make your Holi full of crazy fun! Bhojpuri Holi song 2019: The festival of colours and happiness, Holi is almost here and we get you some of the best Bhojpuri superhit DJ mix Holi songs for 2019 featuring Bhojpuri superstars such as Khesari Lal Yadav, Pawan Singh, Nisha Dubey, Dinesh Lal Yadav aka Nirahua and Amrapali Dubey. The songs will make you wait eagerly to dance on Holi with your friends, family and loved ones. Holi is one festival which makes everyone dance to such amazing tunes and when they are these amazing Bhojpuri Holi dance numbers, no one can stop themselves from shaking a leg this Holi! We get you the videos of popular Bhojpuri Holi songs featuring Khesari Lal Yadav, Pawan Singh, Nisha Dubey, Nirahua and Amrapali Dubey such as Holi Mein GST Jor Ke, Bhaiya Ke Saali Gharwali Hamar Banja, Range Da Jobanwa, Na Bhail Control, Lalki Odhniya, Holiyo Me Na Aail Bhatar, Bhatar Aihe Holi Ke Baad 2, Falana Bo Dharail Ho Holiya Me, Rangawa Se Gila Sej Bhayil Na, among many others. Dinesh Lal Yadav aka Nirahua is one of the biggest stars of the Bhojpuri film industry and is known for his amazing dance numbers. His songs along with Bhojpuri YouTube queen Amrapali Dubey garner millions of likes on video-streaming platform YouTube.